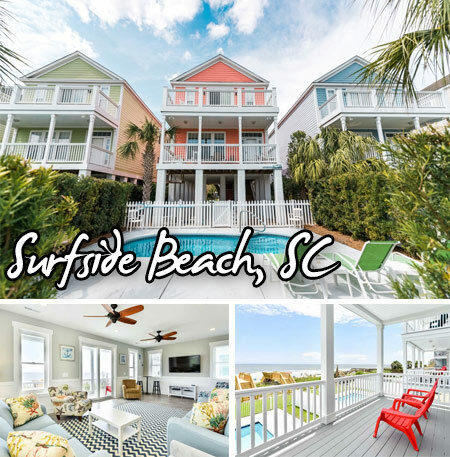 Surfside Beach is right for you if you're looking for a peaceful South Carolina vacation without the chaos and noise of the larger resorts. Just minutes south of Myrtle Beach where there's endless entertainment and activities, our Surfside Beach house rentals provide the peace of mind you've been looking for. Enjoy this tranquil destination by staying in one of our vacation house rentals along the beautiful coast. It's a combination of the family-friendly, laid back atmosphere and the awesome beaches that make this a great vacation for any family. You can enjoy warm weather, peaceful walks on the beach, unlimited activities, and first class amenities here. Surfside Beach is a great option for any family whether you're a family of 2 or 12. Our rentals are often less expensive than hotels and far more spacious. Some amenities offered are swimming pools, hot tubs, walkways to the beach, covered decks, fully equipped kitchens, free wireless internet, washer/dryer, and plenty more! If a condo would be more suitable to you on your vacation, take a look at all of our condo rentals in Surfside Beach. WE HAVE 180 PROPERTIES AVAILABLE FOR THE SEARCH CRITERIA YOU ENTERED.